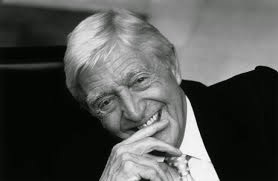 Happy 80th Birthday today to Michael Parkinson. Parky’s career is pretty well-known: cub reporter on the South Yorkshire Times, National Service (Private Parkinson RAPC, army number 23131269), back to Civvy street and reporting for the Barnsley Chronicle, Yorkshire Evening Post, Manchester Guardian, ABC Television (at their Didsbury studios), down to Fleet Street to work on the Daily Express, back north to Granada TV (Scene at 6.30 and Cinema), a brief (unsuccessful) spell with the Beeb on 24 Hours, sports column in the Sunday Times and a daytime show for Thames, Tea Break. And all this was before the start of his eponymously-titled chat show. As Michael recalled in his autobiography; “Tony Preston was head of variety at the BBC. One day in the spring of 1971 he called and said he wanted to suggest me as the host for a new late-night talk show the BBC was contemplating, Would I be interested?” By then he was thirty-six and “never imagined the show I was about to do would define my working life for the next thirty-six years”. 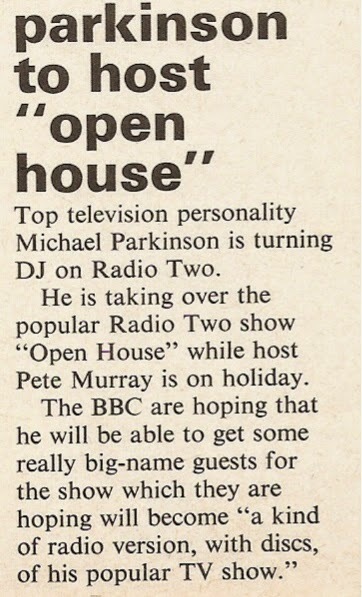 Meanwhile over on BBC radio Michael was fast becoming ‘Parky the DJ’ on Radio 2. 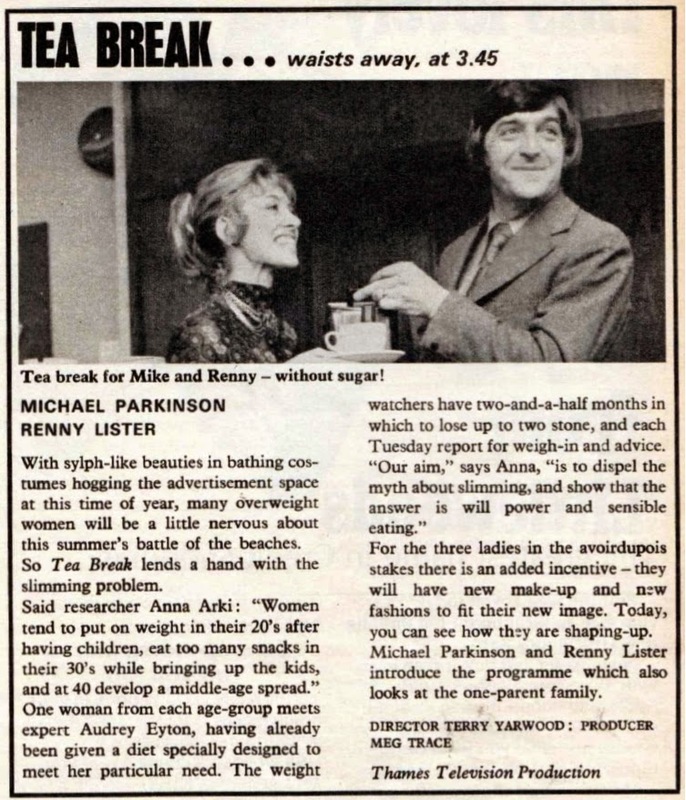 In 1969 he was one of the presenters of Late Night Line-Up and a couple of years later on the rota for the daily magazine show After Seven. There were also stints deputising for Pete Murray on Open House. On Radio 4 he was an occasional panellist on Any Questions and teamed up with wife Mary on the talk show Mr and Mrs Parkinson. 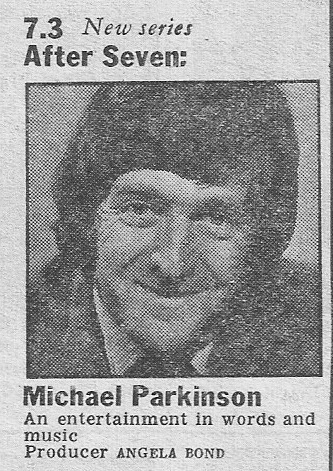 In late 1985 there was a six-part series titled Michael Parkinson, though you didn’t hear that much of him. Instead it was merely a vehicle for clips from the BBC’s Sound Archives. In this, the first edition from 12 November, you’ll hear Malcolm Muggeridge, Jonathan Miller, Round the Horne, Robb Wilton, Arthur Marshall, Peter Sellers and a classic interview about the delights of living in Tunbridge Wells that you’ll have probably heard before. When Parkinson himself had appeared on Desert Island Discs in 1972 he’d found it “a profoundly depressing experience.” So when some thirteen year later Radio 4 controller David Hatch asked him to take over the show following the death of its creator Roy Plomley he had “reservations”. “The problem”, opined Parky, “was Plomley himself. He seemed bored with the show, not the slightest bit interested in the guest’s story, more in favour of a long lunch at the Garrick with a bottle of wine before the interview took place in what seemed like a broom cupboard at Broadcasting House.” Plomley’s widow, Diana Wong, didn’t think much of the appointment, favouring either John Mortimer or Richard Baker, and thought Michael not “civilised enough”. With his journalistic background the interview part of Desert Island Discs became more probing and enquiring, perhaps a little intrusive at times, but this was to become the template of the show ever since. Michael’s first guest when DID returned to the airwaves in January 1986 was the film director Alan Parker. This is my recording of the full show. Parky’s tenure on Desert Island Discs lasted until March 1988. Two years he was one of the re-launched LBC Newstalk team, along with his old TV-AM colleague Angela Rippon. His daily mid-morning show ran for a couple of years. Aside from the cinema and the Great American songbook Micahel’s other passion was sport. Between 1994 and 1997 he presented the weekly Radio 5 Live show Parkinson on Sport. Parkinson’s Sunday Supplement first aired on 31 March 1996 as part of a number of schedule changes implemented by controller Jim Moir, who’d joined the station the previous November. Moir’s objective was “to gain listeners, especially among the group that every radio station in the country is fighting for – the fortysomethings. My first changes are to signal to them that Radio 2 is on the move on Saturdays and for two hours on Sunday. We want to share our music with a generation that feels a bit dispossessed and give them a radio station that doesn’t just play hits in a repetitive way.” For listeners to the Sunday Supplement this inevitably led to plenty of plays for Sinatra, Jamie Cullum and Diana Krall. This is a full show from late in the programmes run and was broadcast on Radio 2 on 4 November 2007. Michael’s guests are John Dankworth and Cleo Laine. Helping to review the Sunday papers is Gillian Reynolds and the entertainment guide is provided by Hilary Oliver. By 2007 Michael had announced his retirement from regular broadcasting, signing off from both the Sunday Supplement and his TV chat show, now over on ITV. Of course he never quite said goodbye. In the interim he’s spent much of the time popping on TV in perfecting his role as an old curmudgeon remarking how TV production at the BBC isn’t what it was and meantime offering daytime viewers of a certain age a free Parker pen. On Radio 2 there have been two series of My Favourite Things. Many happy returns Sir Michael!